Erin and Matt love old books, and wanted their invitations to be reminiscent of illustrations seen on a book by Proust. For color inspiration, Erin brought in a beautifully ornate, jewel-toned living room photo from Veranda magazine. In other words, a dream project! Erin and Matt’s save the dates featured a green and navy marbled pattern like on the endpages of their favorite novels, with copper foil lettering. For their invitation, we worked with vintage-styled copper foil flowers framing the text. We played with lots of different illustrations and layouts, and settled on this one for its lush garden-like feel. 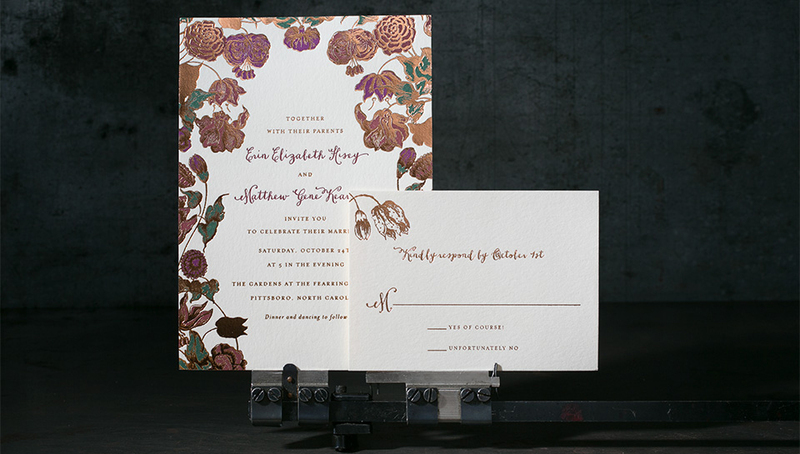 We printed the flowers on ecru cotton paper in plum, green, and burgundy letterpress, with copper foil on top, and used copper foil on the reply card and for addressing on dark green envelopes. Lots of fun, this project! Thanks to Boxcar Press for the printing and photos on grey.